With its mountains and deserts, New Mexico can have extreme heat in the summer months. Also known as the Monsoon Season, in July and August, residents often endure ferocious rains and intense thunderstorms. Thus, when selecting a roof for your home or business property, you’ll need a material that is strong, hardy and durable. Although lightweight, our metal roofs are able to withstand winds of as high as 120 mph. Having a metal roof will also help to keep in the heat on those cold winter nights. Vice versa, its design keeps the attic or upper level of your home or office cool thus reducing your use of air conditioning. Call us today to learn more about our roofing products. We offer a variety of colors and designs to meet your design and structural needs. 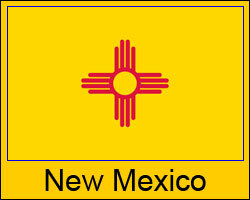 We service all areas in New Mexico including large cities and small towns. In fact, we will deliver product to your work site for added convenience. Our listed prices are valid for the entire state although some shipping restrictions do apply. Click here for details on shipping to your job site. Most of our products include a 30 to 50 year warranty. Metal roofing is environmentally friendly. Reduces energy costs. Many styles and colors qualify for the Energy Star tax credit. We serve Albuquerque, Las Cruces, Santa Fe, Roswell, Farmington, Gallup and every New Mexico town and community in between. Environmentally friendly – approximately 56% of the steel content is from recycled metal.